To make these I used Creative Paperclay® air drying modelling material that I rolled out flat first. Then I cut out the tags with a plastic knife while using a template I have. Once the clay is dry it is just like working with paper and can be coloured on with any medium. Dry paperclay can also be cut and even hole punched just like regular thick paper. It is such a versatile medium to work with. 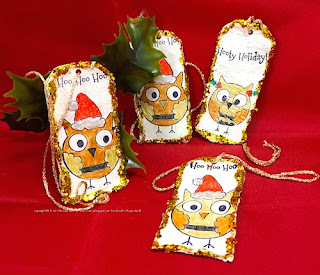 To see more pictures of all the steps I took to make these very tags just pop over to the CP blog where I post all the steps. Thank you so much for stopping by today, and go get crafty.